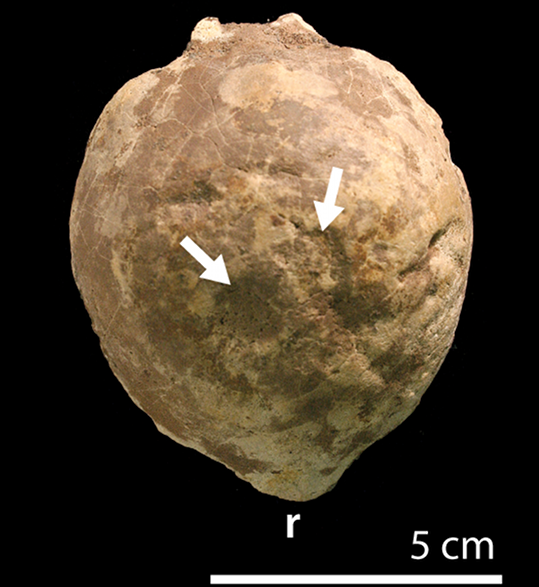 Cranium of Sphaerotholus buchholtzae in dorsal view (arrows indicate lesions), from Peterson et al. (2013). The Pachycephalosauria are a group of bipedal herbivorous dinosaurs with a thickened skull roof known from the Cretaceous of Eurasia and North America (Maryanska et al. 2004). In basal members of the group, such as Homalocephale calathocercos, the dorsal surface of the skull was relatively flat, but in the derived Pachycephalosauridae it became high and dome-shaped. Characters (from Maryanska et al. 2004): Skull roof thickened; frontal excluded from orbital margin; postorbital bar with dorsal surface flat, broad; parietal without caudolateral wings; squamosal extended onto occiput, bearing tubercles on caudolateral margin; basal tubera thin, platelike; prootic-basisphenoid plate contacting pterygoid-prootic plate; jugal and quadrate eliminating free ventral margin of quadratojugal; dorsal vertebrae with double ridge-and-groove articulations; sacral ribs elongate; caudal basket of fusiform ossified tendons present; illium with sigmoidal border; medial process present on iliac blade; pubis nearly excluded from acetabulum. [MCW04] Maryańska, T., R. E. Chapman & D. B. Weishampel. 2004. Pachycephalosauria. In: Weishampel, D. B., P. Dodson & H. Osmólska (eds) The Dinosauria 2nd ed. pp. 464–477. University of California Press: Berkeley. [S03] Sullivan, R. M. 2003. Revision of the dinosaur Stegoceras Lambe (Ornithischia, Pachycephalosauridae). Journal of Vertebrate Paleontology 23 (1): 181–207.